On October 17th 2013, a delegation from Grand River Indigenous Solidarity, a grassroots collective of activists working on settler responsibility on occupied territory, presented to the NEB hearings into the line 9 pipeline reversal project. After convincing the NEB, through a 10 page application that they were a "potentially affected party", GRIS presented as intervenors in the hearings, giving evidence into the failure to uphold treaty responsibilities or honour agreements around consultation and free, prior, and informed consent. While focusing mainly on the Grand River watershed, the so-called "Haldimand Tract" of the Haundenosaunee, GRIS also brought up the canadian Charter, the Two Row Wampum, the Nan fan Treaty, the Royal Proclamation, and the UN declaration on the rights of Indigenous peoples in their evidence. Environmental concerns, lack of community benefits, and the unwise creation of more carbon fuel infrastructure were also discussed as points against Enbridge's Line 9 project. This is my colleague and friend Rachel Avery and my name is Dan Kellar. Today we are presenting on behalf of Grand River Indigenous Solidarity, a collective of settlers working towards decolonization. Our organising is guided by the Two Row Wampum and a framework of coexistence based on autonomy and non-interference.We support Indigenous self-determination, and challenge the historical and ongoing oppression/dispossession of Indigenous peoples and their lands by settler governments. We’d like to begin by acknowledging the land we are on today as the Anishinaabe territory of the Mississaugas of the New Credit, and the land where our group organises from as Blocks 2 and 11 of the Haldimand Tract, which is in the Grand River Territory of the Six Nations Haudenosaunee. We say this to bring attention to our responsibilities as settlers on this land; responsibilities to the Onkwehon:we people, and to the treaties and agreements our governments and crowns have made with them. We also say these things to base our conversation today with understanding that the settler colonial state of canada, and its corporate agents, do not have unfettered rights to the land. All settlers who build cities, borders, institutions and authorities here, and certainly those who extract resources from the land, have a responsibility to honour the treaties that have allowed for the establishment of this society -- in our lives and actions and through the people who act as our representatives in the government, this is paramount. We need to recognize that we are bound by international and nation-to-nation treaties and agreements -- some made long ago, others more recently -- that establish how relations are to move forward with peace, respect, and friendship between the canadian crown and Indigenous nations, and we need to act accordingly. This line 9 reversal plan, the impacts from the extraction and refinement of the products it is to carry, as well as the forecasted rupture of the pipe are all point sources of the ongoing colonialism and environmental racism prevalent throughout this oil-soaked colonial-capitalist system. The Two Row Wampum, the Nanfan, and the Haldimand treaties, the Royal Proclamation, the Canadian Charter of rights and freedoms, and the UN declaration on the rights of indigenous peoples, are a few of the many treaties and agreements we have made and which are being infringed upon by the the line 9 project proposal. With the understanding of the above responsibility to treaties, and knowing what those responsibilities entail, we assert that the NEB must reject this proposal and put a full stop to all ongoing decision making processes until they are prepared to fully honour their responsibilities as agents of the crown. These responsibilities include ensuring that free prior and informed consent is sought from indigenous nations when a project that may impact them is proposed, and that real consultation on such projects -- not simply notification and follow-up -- actually takes place before they are permitted to move forward. If a corporation is undertaking a project, the NEB must still ensure the duty to consult is undertaken, and in this case, Enbridge must not move forward with their plans until that duty is honoured. On this point, we ask if either the NEB or Enbridge feels that the duty to consult has been honoured and that the free, prior and informed consent of affected Indigenous peoples has been sought and gained. We also ask if the NEB and Enbridge will respect the right of Indigenous people to say no to projects they deem unnecessary or too great a risk. From presentations we have heard already, and evidence submitted by fellow intervenors including Mohawk Council of Kahnawà ke A53321, Chippewas of the Thames First Nation, A53523 and and Aamjiwnaang First Nation A54545 - it seems that the NEB nor enbridge have honoured the treaties. While the NEB will not consider the upstream impacts from the extraction processes on stolen Indigenous land in Alberta and North Dakota, it cannot ignore the cumulative effects of the petro-chemical industry which is toxifying the land at the Western terminus of Line 9--the land of Aawmjiwnaang Anishinaabe. The more than 60 industrial plants have earned the area the title “chemical valley,” which, according to the WHO is the most polluted area in North America. Enbridge or the NEB must consider the increased toxic threat volatile fracked gas, tar sands bitumen, and the dilutants and drag reducing agents pose to the people of Aawmjiwnaang and other residents of the area. Grand River Indigenous Solidarity has been a part of regional opposition to the pipeline plan which coalesced in the Waterloo Region coalition against line 9 (http://noline9wr.ca). Together with other local organisations who signed on to our declaration of opposition to the Line 9 project and joined the coalition, we undertook a campaign of public education and outreach as well as grassroots mobilisations and resistance to the pipeline reversal plan. Enbridge’s consultation with our local region consisted of a 10 minute presentation with no questions, in which they said dilbit will make up only a small fraction of product shipped and that everything associated with the project as a whole was safe. However, the Coalition Against Line 9 presented at Waterloo Regional council, and since then the council has sent a letter to the NEB informing them of the intention to file a statement of concern over this project. While we recognize that the region’s efforts come late to this process, I feel they would have spoken out sooner had enbridge meaningfully and truthfully engaged them with the details of the proposal, since their concern about the project was evident. We found a similar situation when presenting to the Grand River Conservation Authority. There, staff was unable to answer questions about the products being shipped through the line despite taking part in so-called “emergency exercises” run by Enbridge on the Grand River itself only days earlier. On pushing for greater consideration and initiative from the GRCA, foregrounding their responsibility for the health of the Grand River, the local coalition forced them to table the issue for discussion again and reexamine their data after the Coalition's concerns were then echoed and amplified by several of the GRCA's members during this meeting. As similarly indicated by the Waterloo Regional Council's eleventh-hour engagement with this NEB process, we understand the GRCA's befuddled position to be symptomatic of Enbridge's lack of honest consultation with any of the many communities along Line 9's route. Kitchener MPP Catherine Fife is also drafting a letter of support for the regional campaign against line 9, and is supporting the call for a provincial environmental assessment as a starting point for the project. Today we present to you the Declaration of Opposition to Enbridge’s Reversal of Line 9 along with the coalition's 25 member organizations from our region who have signed onto the statement and over 800 individual signatories who have joined them, an auspicious number which continues to grow as real public awareness of this project is increasing. Line 9 is a 38-year-old pipeline that has been transporting light crude oil between Montreal, Quebec, and Sarnia, Ontario. The pipeline runs through hundreds of communities, the territories of many Indigenous nations, and dozens of watersheds, including the Grand River. Enbridge Inc. has applied to reverse the flow of the pipeline and send diluted bitumen (dilbit), a form of heavy crude from the tar sands, through Line 9. This will threaten life around and downstream from the pipeline. Line 9 was not built to withstand the transport of diluted bitumen, a toxic compound that poses a particularly dire threat to communities and ecosystems. In 2010, a break in the nearly identical Enbridge pipeline in Kalamazoo, MI, caused the largest inland oil spill in American history, which the company is still struggling to clean up three years later. When Enbridge proposed essentially the same project as the Line 9 reversal in 2008, under the name Trailbreaker, it was successfully opposed based on safety concerns. Just because Enbridge is currently seeking approval for the project piece by piece—the reversal of the first half last year, and the second half plus the transport of bitumen this year—there is no reason for us to accept it now. The threats remain just as serious. 1) The transport of bitumen through this pipeline poses a terrible risk to the Grand River and the surrounding watershed. We all rely on the watershed to sustain life within this region, but given Enbridge's track record of pipeline spills, leaks, and failures, Line 9 will put the shared environment and collective health of our region in jeopardy. If we let this reversal happen, we are endangering drinking water for this Region, as well as that of every community downstream on the Grand River. 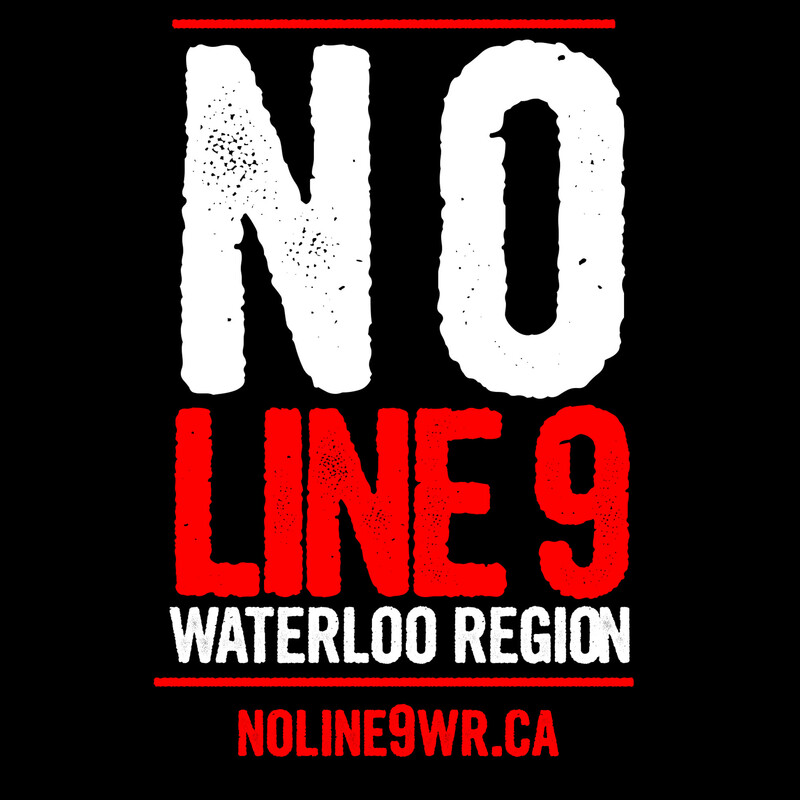 2) Reversing Line 9 will provide no benefits to the Waterloo Region or local residents. It will not create jobs or provide new sources of energy for the municipality; local industry is not supported by the pipeline, and the bitumen passing through the pipeline will be shipped to markets in the United States and overseas. Yet, were a spill to occur, it would threaten the land on which our food is grown, and the rivers and aquifers from which our drinking water is drawn. This reversal poses a great risk to farms, small businesses, public institutions, rural and urban communities alike, and to our economy overall. 3) The reversal of the pipeline violates current treaties with Indigenous communities, both within the Haldimand Tract and elsewhere along the route. There has been no free, prior, and informed consent from these communities with regard to this pipeline project, which already cuts through their lands and territories. As residents on the Haldimand Tract (Six Nations’ Grand River Territory) it is crucial that we respect and act on this responsibility to consult. 4) Bitumen is more difficult and expensive to clean up than conventional crude. Recent spills like the one in Kalamazoo, MI, are evidence that Enbridge’s clean-up process and safety procedures have been woefully inadequate in dealing with the inevitable release of toxic tar sands bitumen. Given Enbridge’s track record of more than 800 significant pipeline spills in the past 15 years alone, we can expect spill incidents along Line 9. It is not a question of if but when this will happen here. Enbridge expects local responders to take responsibility in such emergencies. Thus, the cost of clean-up for a pipeline failure would result in increased financial burdens on local government, and would tax the capacity of our emergency responders. 5) The reversal will further entrench our region in the carbon economy, which contributes to climate change. This will lead to more frequent and devastating natural disasters. Pipeline projects like Line 9, the Keystone XL, and Northern Gateway, support the expansion of the Alberta tar sands industry. We envision a future where our lives and economies are not dependent on fossil fuels and do not contribute to the greenhouse gases and additional pollutants they produce. We recognize that supporting further extraction from the tar sands and other fossil fuel energy sources will continue to prevent the development of real sustainable alternatives. We will expand on a couple of the points on the declaration and pull from our evidence submission a5335. This treaty, recorded in a wampum belt, outlines a model of coexistence between the Haudenosaunee and settlers. It is a non-interference agreement based on the principles of peace, respect, and friendship. In order to make decisions about our shared landbase without interfering in the other party's course as a society, following the spirit of this agreement requires consultation and free, prior, and informed consent. This has not occurred for the reversal of Line 9. Six Nations was given a tract six miles wide on either side of the Grand River in recognition of their role defending Upper Canada during the American Revolution and in compensation for their lands lost in what is now the United States. This tract, “which Them and Their Posterity are to enjoy forever,” extends along the entire length of the Grand River. Six Nations currently has less than 5% of the original land granted in the Haldimand Treaty. By threatening the land surrounding and downstream from Line 9, the intent of the Haldimand Treaty is violated. Beyond the lands allotted in the Haldimand Treaty, the Nanfan Treaty assures the protection of Six Nations' ability to hunt and fish in territory extending across the majority of southern Ontario, rights affirmed by the Canadian Charter of Rights and Freedoms (1982, section 35(1)). Indeed, the Charter states that the duty to consult “arises when the Crown has knowledge...of the potential existence of the Aboriginal right or title and contemplates conduct that might adversely affect it.” Thus, the government is obligated to consult Six Nations before a project that could impact their ability to hunt and fish on the Nanfan lands, as the Line 9 reversal well could, is commenced. Royal Proclamation (1763) - The Royal Proclamation is a document that set out guidelines for European settlement of Aboriginal territories in what is now North America. the Royal Proclamation explicitly states that Aboriginal title has existed and continues to exist, and that all land would be considered Aboriginal land until ceded by treaty. The Proclamation forbade settlers from claiming land from the Aboriginal occupants, unless it has been first bought by the Crown and then sold to the settlers. The Royal Proclamation further sets out that only the Crown can buy land from First Nations. This document was further understood with the Treaty of Niagara 1764. Canadian charter (1982), - Section 35 of the Canadian Charter recognized and affirmed the existing treaty rights of the Indigenous peoples of Canada, effectively reaffirming the Royal Proclamation of 1763 in the process. With non-compliance of the above treaties and agreements, Enbridge corp, and the Crown are in contravention of the Canadian Charter. This Declaration, to which Canada is a signatory, includes many stipulations to ensure the rights of Indigenous peoples with regard to land, culture, and political self-determination. Paramount among these is the necessity of free, prior, and informed consent for decisions impacting Indigenous peoples or lands. The Declaration states in part that “Indigenous peoples have the right to participate in decision-making in matters which would affect their rights, through representatives chosen by themselves in accordance with their own procedures,” that “Indigenous peoples have the right to the lands, territories and resources which they have traditionally owned, occupied or otherwise used or acquired,” and that “Indigenous peoples have the right to the conservation and protection of the environment and the productive capacity of their lands or territories and resources.” These rights have been thoroughly disregarded by Enbridge and the Canadian government in planning the Line 9 reversal. But as is made clear in the treaties discussed above, by failing to engage in meaningful consultation and obtain free, prior, and informed consent, Enbridge and the Crown are interfering with fundamental treaty rights of Six Nations and other Indigenous communities along the pipeline's route, and disregarding their own treaty responsibilities. Enbridge’s proposal, in addition to violating treaties in its basic process, poses a grave threat to ecosystems adjacent to and downstream from Line 9. In Waterloo Region, Six Nations land, the risk to the Grand River watershed is substantial. As Line 9 crosses it and its tributary the Nith River, there is an immediate danger of a spill into this water system, which in turn feeds into Lake Erie. We will now highlight particular risks of the Line 9 proposal faced by ecosystems and local use of land in the Region of Waterloo. The Grand River watershed is the largest in southern Ontario, encompassing all the land drained by the Grand River (6,800 km2). The headwaters of the Grand River begin in the area of Dundalk, ON, flowing south from there to drain into Lake Erie. Waterloo Region is situated in the central portion of the watershed, an area which includes numerous moraines as well as the Norfolk Sand Plain. According to the Grand River Watershed Characterization Report, these specific ecosystems are home to some of the most complex groundwater systems and most specialized wildlife habitats in the province. The Grand River Conservation Authority has documented that 80% of the classified “Species at Risk” in Ontario can be found in the Grand River watershed, including “Endangered Species” like trumpeter swans and the bald eagle. With the wealth of rich farmland fed by the watershed, local food systems in the Region of Waterloo are positioned to be at risk of an oil spill. The land is intensively used for both mixed farming as well as cash crops - with 75 per cent of the watershed actively farmed on 6,400 farms - which feed residents and the local economy overall. However, the frequent tilling and planting makes these nutrient-dense soils more permeable, which in turn makes it easier for contaminants to penetrate and pollute the soil and groundwater alike. Most important to municipalities in Waterloo Region is the safety of drinking water supplies, which come from three sources throughout the watershed: groundwater wells (69 per cent), rivers (29 per cent) or the Great Lakes (3 per cent). Since groundwater systems directly feed the Grand River which in turn drains into Lake Erie, if an oil spill occurs in one area it has the grave potential to impact the entire watershed. It is understood that, because the Grand River watershed is such a large and complex web of ecosystems, even if the spilled oil is prevented from spreading further the initial contamination will nonetheless affect the health and diversity of the Region as a whole. Following on increasing calls of concern from local residents, Enbridge scrambled to conduct an eleventh-hour “emergency exercise” for the Region on September 25, 2013, in the local township of North Dumfries. The exercise included a mock release of 1,400 barrels of crude oil into the Grand River. According to the report presented to the Waterloo Region Police Services Board in the week prior, if a spill does occur, people living in the area may be forced to relocate to an emergency shelter. Though the exercise purported to test capacities of local emergency services to respond in the immediate aftermath, the potential long-term effects on health and environment in the Region have yet to be considered. The economic consequences of the reversal are also unfavourable for those other than Enbridge itself. The reversal will not generate local jobs nor will it supply other financial benefit. It does, however, present serious economic costs in the event of a spill. In the Waterloo Region a spill would be devastating for local farmers with the contamination of crop lands and agricultural areas. Further, any spill locally, or along the route, is likely to affect major bodies of water and watershed systems. Were a spill to occur it is likely that contaminants would wash into the Grand River and the Grand River Watershed. The contamination of the local water supply, is also potentially devastating for agricultural communities and all those who rely on the Watershed for economic activities. A spill would grind many types of economic activity to a halt. And with Enbridge’s track record, and the fact that Line 9 is of the same vintage as Line 6 that ruptured in Michigan, after being subjected to the same changes Enbridge is proposing here, it is only a matter of time before we will have to deal with a Line 9 spill. Overall, line 9 will be all risk and no benefit to both the economy and the environment in Waterloo Region. We would like to now focus on the inability of the Enbridge corporation to keep the toxic products they are shipping in their pipelines and pumping stations, or to effectively clean up their toxic mess once their systems fail. Beyond the 12 or so large spills Enbridge has reported on Line 9 over its operational history, we must point out the startling and sobering evidence that their own most recent Integrity Assessment (B1-15 of A49446) found more than 200 previously undetected cracks, 56 new dents, and 9 fresh corrosion issues. Additionally, Enbridge reported 800+ significant spills in the period between 1999 and 2010, and we cannot help but bring up once again the devastation caused by the Line 6B pipeline rupture and the systemic failure of the company to effectively mitigate the impacts of the break. The incompetence shown by Enbridge in the Line 6 situation cannot be swept away with a statement from the company claiming that they have changed. Compounding on the shameful situation in Michigan is news that Enbridge is failing to compensate tribal councils and other affected authorities for costs incurred in the pipeline rupture response and cleanup attempts which are still ongoing even now, more than 3 years later. In addition to reversing the flow of the pipeline, changing the products to be shipped through it to include tar sands products, and increasing the daily capacity of the line, it also appears that Enbridge seeks to operate the line at a higher pressure than it has previously sustained. The same combination of changes to pipeline operations led to the failures of Line 6B in Michigan, and Exxon’s devestating 2013 pegasus pipeline failure in Arkansas. In addition to the work of GRIS, the Waterloo Region Coalition Against Line 9, and fellow NEB intervenor Louisette Lanteigne, a group with a history of intervention in tar sands projects, the Climate Change Containment Unit, also participated in the local resistance to Line 9. Although they were not able to submit as intervenors, we will use this opportunity to present the critical reflections the CCCU posted around the region following a training exercise on the Grand River carried out by Enbridge. On September 25, 2013 Enbridge Pipelines Inc. and local municipalities staged an emergency response exercise involving a simulated oil spill of Enbridge's Line 9 into the Grand River (Six Nations territory). The Climate Change Containment Unit (CCCU), whose rapid responders were present on scene to monitor the situation, has conducted a review of the exercise and is providing notice of its findings. Enbridge's exercise simulated the death of the Grand River, forecasting Line 9's impending failure, and their response was fundamentally inadequate to address the impacts of a real spill. The CCCU finds that Enbridge's exercise amounted to a media stunt without grounding in environmental protection. The CCCU's experts were on river, and observed a high rate of flow above seasonal norms that would have carried a bitumen spill far further downstream than Enbridge accounted for. Their six hours on site were insufficient to contain the scenario's overnight rupture of Line 9. Enbridge's exercise is designed for dealing with conventional light crude, and they have not provided training for dealing with diluted bitumen (dilbit) which is proposed to be shipped through Line 9. In statements made to media present at the exercise, Enbridge stated that it considers dilbit to be the same as light crude. The CCCU notes that unlike conventional crude, dilbit in fact sinks in bodies of water, making its clean-up much more challenging and costly. Enbridge's exercise hinged on a boom dragged across the river, designed to halt the flow of oil on the surface of the water, entirely ineffective for dilbit. Enbridge's response to the 2010 rupture of line 6b in Kalamazoo, MI evidences their lack of preparation for such a situation, as well as the extreme measures required to remove spilled dilbit. As occurred here, emergency responders in Michigan were trained by Enbridge to respond to a pipeline failure, but this preparation was entirely insufficient when 3.3 million litres of dilbit devastated 60km of the river. Alarmingly, the Grand River Conservation Authority (GRCA), entrusted with the maintenance of the river, was unaware of Enbridge's plans to ship dilbit and fracked oil in Line 9. They are participating in Enbridge's media stunt and preparing for inevitable clean-up rather than protecting the watershed. The exercise, planned by Enbridge, involved municipalities and the GRCA, but failed to include Six Nations, whose treaty land includes the Grand River. This failure to include the Haudenosaunee continues Enbridge's pattern of disregarding the need to engage in consultation and obtain the free, prior and informed consent of Indigenous peoples on whose territory they operate. The CCCU notes that this disregard for treaties and other international agreements is standard to Enbridge and other corporations engaged in extractive industry, and continues the process of colonization championed by the canadian state. The tar sands themselves are effecting the genocide of Indigenous communities in their vicinity and wherever this bitumen is shipped. After each failure of their infrastructure, Enbridge claims to have changed their policies and safety procedures. However, Enbridge has documented 804 significant spills on their lines from 1999-2010, and their pipelines continue to break, including Line 37 in July, which Enbridge attributed to “too much rain,” a symptom of the extreme weather events characteristic of continuing climate change. The CCCU concludes that Enbridge's Line 9 reversal project poses a substantial risk to the watershed, furthered by their dangerously inadequate clean-up procedures and refusal to engage in meaningful consultation. Furthermore, the Line 9 reversal supports tar sands expansion and traps us in the carbon economy, fueling climate change and its attendant destruction of the environment and communities. In conclusion, it is our assertion, based on both our own research and the evidence presented by other intervenors in this process -- including Rising Tide Toronto and their comprehensive submission (A53333), the Algonquin to Adirondacks Collaborative with their demand for adaptive, not one-size-fits all, plans (A53443), Durham Clear and their critique of the safety systems (A53330), and Louisette Lanteigne and notes around pipeline eating bacteria (A53270), and those already mentioned -- that the NEB has no choice but to reject the proposal to reverse the flow of Line 9 and ship heavy crude through this pipeline. Between a lack of consultation with, and not seeking the free, prior, and informed consent from, impacted Indigenous nations, the paltry notification Enbridge supplied to impacted municipalities, the poor communication towards landowners, and the very real and dangerous threat that a rupture of Line 9 carrying bitumen poses, this project cannot be considered to satisfy any measure of environmental safety or responsibility. Additionally, while the process used to approve it stands in violation of treaty responsibilities and notions of democracy that the state of canada proclaims as fundamental. Thus, we encourage the NEB to act in a manner that honours its treaty responsibilities and basic duties to protect the environment and communities from the disasters that would inevitably result from the approval of Enbridge’s Line 9 proposal.